Phobya fan splitter, a central distributor piece for your cooling system! Especially in systems with many fans, or large radiators which require many fans, it is often a hassle that all of these fans have to be connected with long and messy cables. Here the Phobya 4-Pin Molex to 6x3-Pin Splitter comes in very handy and allows clean cable management. The central connection point even improves performance, as the cooling air can flow through the system with less resistance. A Velcro mat and a suitable spot to stick it, this splitter can even be installed upside down at virtually any place in your enclosure. 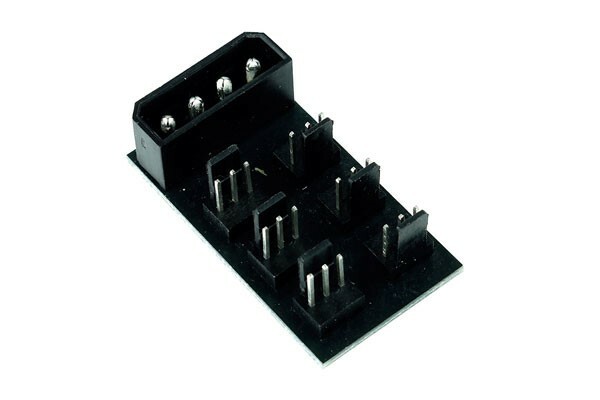 Nein, aber man kan durchaus vor den 4-Pin Molex Anschluss einen 7 oder 5V Adapter dazwischen stecken umd ie Lüfter zu drosseln.